Activates metabolism, stimulates the blood circulation and enhances lymphatic drainage. Promotes lipolytic processes in major cells of the adipose tissue where the cellulite occurs, boosting the fatburn process and weightloss. 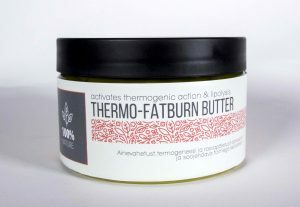 Active ingredients of butter as a fairly active effect, it works for several hours after the procedure, contributing to the body shape corrections. Active ingredients: jojoba oil, wheat germ oil, lemon wax, caffeine, red pepper oil CO2 extract. Application: apply a small amount of butter on problem areas with light massage movements. To increase the slimming effect, cover these areas with a film. Leave on for no more than 30-40 minutes. If necessary, wash off after treatment. For best results apply the butter prior the Cryo and Detox wrapping procedure. 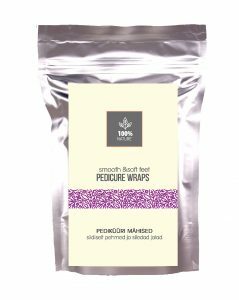 Wrappings for pedicure are much more effective and convenient thanfoot baths. They soften toughened skin and stimulate blood circulation, removing sense of fatigue and puffiness. 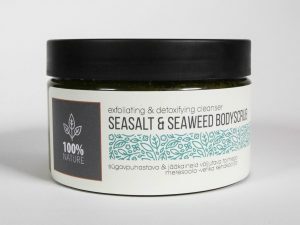 Extremely aromatic citrus scrub with algae extract and Dead Sea salt is suitable for deep cleaning of any skin type, improves texture and skin elasticity, removes signs of fatigue, reduces swelling and enlarged pores, accelerates regeneration process. Can be used for problem skin. Has a cholagogic effect. Ingredients: Dead Sea salt, fucus extract, laminaria extract, lanablue, wheat germ oil, coconut oil, orange oil, grapefruit oil, lemon oil, lime oil. Natural coffee and sweet almond contain a variety of substances, including vita-mins, useful minerals, necessary polysaccharides and essential oils that help break down subcutaneous fats and remove wastes and toxins. 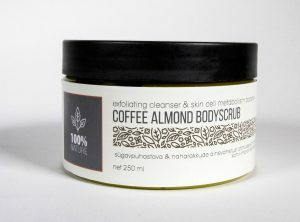 The scrub awak-ens, refreshes, tones up and energizes skin, is effective as an anti-cellulite prod-uct. Ingredients: sodium salt, sweet almond oil, grape seed oil, cocoa butter, babasu oil, Arabica coffee seeds, walnut powder, Dead Sea salt, vitamins A and E.